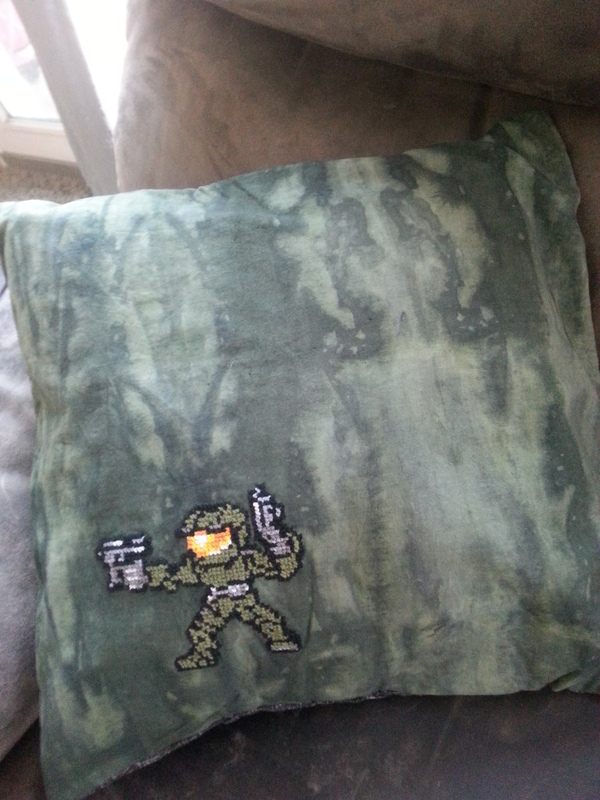 In case you didn’t know, my gamer heart belongs to a certain Spartan who has an unnatural amount of luck so when I decided that I was going to make this craft for Chance over at Destiny Dispatch, I was a happy chick. It also allowed for me to try a new product –water soluble canvas. Never heard of it? Basically, it’s a temporary canvas that allows you to sew on any fabric — no AIDA cloth needed. I have seen Rebecca over at Hugs are Fun using it and knew I wanted to try it out. Let me just say, I didn’t make this pattern. Thanks to the influx of pixel art *cough* Minecraft *cough*, I was able to find a pose of the Chief fairly easily. Some of the squares weren’t lined up, but I managed to work out any hiccups along the way. The outline was first and it was pretty simple. But, as I started working with the other colors, a war between me and the fabric broke out. At first, I was in denial. The fabric loved me. I was making it look 117% more awesome. Every other farbic wished it could have this privilege bestowed upon them. The fabric remained a worthy adversary. For a day, I fought through the battle of DMC. Even after my thumb and finger callused, I still pressed on, knowing that’s what the Chief would want me to do. But when my work slowed down to a snail’s pace, I had to concede defeat and get a true embroidery needle. You know, the one with the sharp point that inevitably sticks you in the finger over and over and you start thinking not nice things about an inanimate objects? Yeah, that one. Though it was much more tedious to work with, it did make the work SO MUCH quicker. 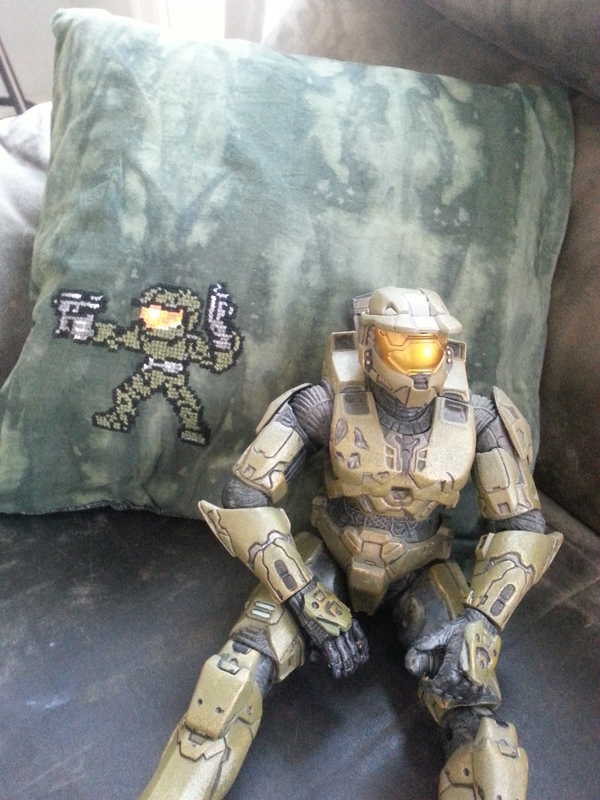 Before I knew it, the Chief was standing there before me, dual-wielding like the Spartan he is. Then, after a soak in some warm soapy water, the canvas disappeared and the fabric was ready to be put together into a Legendary pillow. But, in typical fashion when it comes to using my sewing machine, all progress stopped dead in its tracks. It’s not that I don’t like sewing, it’s just that I would rather work on cross-stitching or check Instagram or get distracted by Twitter. 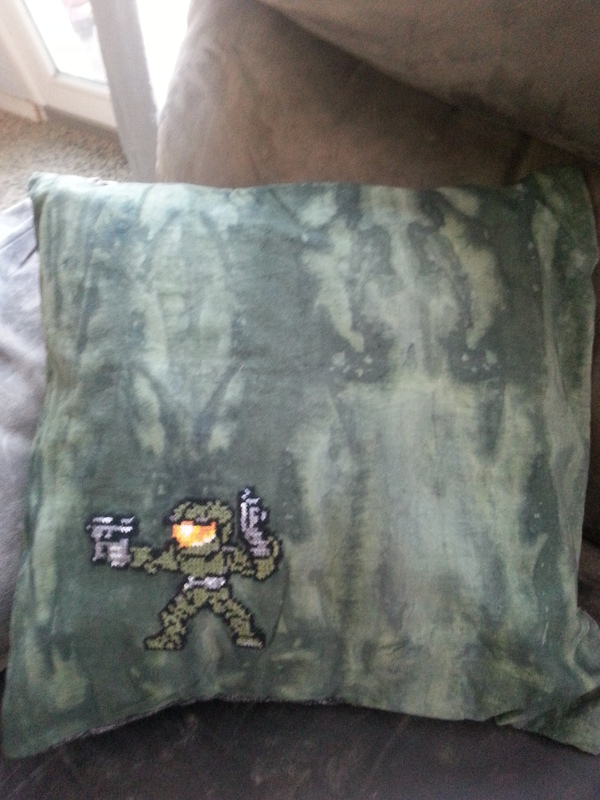 But finally, I lugged the beast out of its cave and sewed the pillow together. It took me all of fifteen minutes (25 if you add in the ten minutes to ladder stitch to opening closed). And that’s it! Now it’s back to the Dark World and more #30for30crafting fun! Your piece turned out awesome! I’m keen to try this water soluble canvas you speak of .. Hadn’t seen it until I saw your post. Great entry, Jess. I love your writing style. MC has never looked better. ❤ MOAR!! Pingback: Water Soluble Canvas for Cross Stitching (or Anything!) | crosstitchery.